Em Stafrace| Just a Girl with Ideas: JUST A LITTLE SPOOKY! 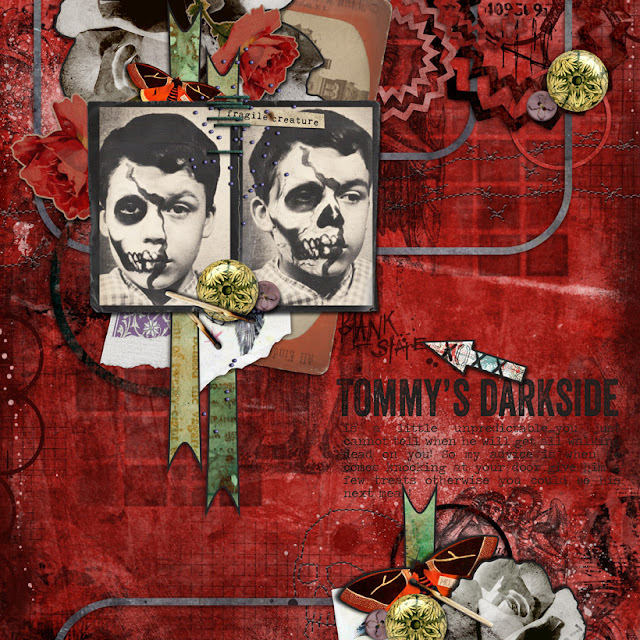 This week Sissy Sparrows released a fabulous kit called 'Dead Inside' which works perfectly for art journaling those dark and empty feelings. But if you are a bit reticent about exposing those inner most emotions this kit also lends itself to creating a couple of spooky dooky pages! Here are some of my CT pages I created for this release. This next one is of the lovely Tracee Provis' granddaughter Star. I asked if any of my friends could share their Halloween pics with me and the very spesh Tracee emailed me these cute pics of Star and her diggy dawg, I knew straight away I could have some fun with these two characters! Thank you for stopping by, have a fabulous Halloween everyone! Two great pages, love them!! !